My bedrooms current situation is pretty good but pretty simple, when we moved in we bought all of our larger furniture bits for the room then moved onto the next room. To be honest when decorating room it’s quite overwhelming to actually complete it and do the final touches. 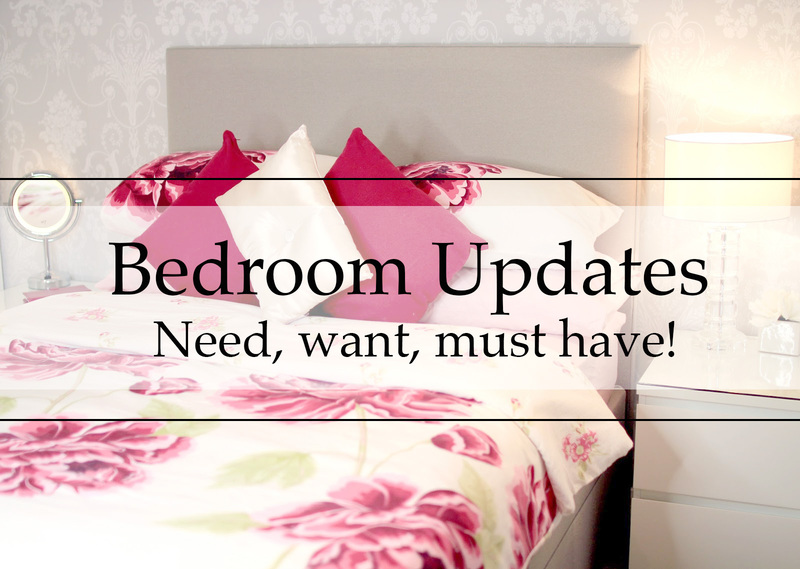 I have found adding final touches to all of the rooms in our house the hardest mainly because I can never really stick to a ‘theme’ or know what goes with what when I think about it in my head so for todays post I want to talk to through a few things I’d love to change and add to our room to really make it a relaxing place that I enjoy being in. A new bed? We did buy a new bed when we moved in but I can’t help but ooh and ahh over these super thick, padded beds with the buttoned details on the headboard. Our headboard is currently just plain which is nice as it’s very simplistic but I do love the buttoned headboards as I think they looks super luxurious and chic. This Ashby Double Bed Frame from Furniture Village is the exact bed I’d buy if we were to buy again, it comes in 13 colours which is pretty incredible of course I’d go for the lightest they have which is the colour natural I just love the rooms in our house to have a light and airy feel about them and I think this would fit in perfectly I’m so obsessed with searching for fab new double beds ahh! On to things I’d like to add to the room that we don’t already have, I need to get some bedside lamps actually. We kind of put off buying them or putting anything on the side tables because of Vinny but I can’t live my whole life being so minimal just because I have a child so Vinny will have to learn what not to touch when they arrive. I’m thinking to getting some lovely crystal lamps as I think that would work really well, maybe with white or silver lamp shades something along those lines and I’d also like to pop some plants or flowers in the room to add some life and colour. Our room is currently quite simple, we have a gorgeous Laura Ashley grey and white wallpaper on the main wall and a huge mirrored wardrobe on the other and lots of white furniture so I think by adding some pretty plants would really be welcomed into the room and look great. Lastly I’d love to add some photos, as mentioned we do have one wall wallpapered but that’s pretty much it so I’d love to add maybe three large square frames above our bed with maybe some black and white photos. I’m never really sure what sort of photos you’d put in a bedroom whether we just keep them as Mark and I or to add pictures of Vinny or to not have any of us at all? Do you have a theme in your room? Specific photos or details, I’d love to know!